Fender Stratocasters have long been the guitar of choice for many guitarists in many styles of music. Over the years, Fender has released many different styles of Stratocasters, and the Strat Deluxe is just one of these. So what makes the Strat Deluxe different from all the other Strats on the market? Well, all the features combined make this guitar a great bargain compared to the other Strats in regards to the bang for the buck ratio, for the rock and metal guitarist. To start things off, this is no ordinary Fender Stratocaster. It’s a premium (American Deluxe) model of the famed guitar, with a premium alder body. In addition, the American Fender Deluxe is brimming with beefy tone, thanks to the DH-1 double humbucker pickup at the bridge, which is why it’s called the “Fat Strat”, the Strat of temptation. 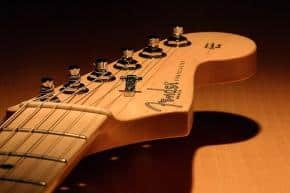 Some older and vintage Fender Strats have earned the reputation of having necks with frets that are rough at the crown. The Fender Strat Deluxe, with its hand rolled edges, won’t have this issue, so you need not worry about a sore hand after playing it. The American Deluxe HSS comes standard with 2-single coil pick-ups and a 22-fret fretboard. What separates the Deluxe HSS from other Strats in this case is the quality of the pick-ups, which are SCN (Samarium Cobalt Noiseless) pick-ups, and, of course, the double humbucker at the bridge. The pick-ups deliver a rich sound that can be tweaked to fit many playing styles. Another feature added on the Deluxe is the S-1 switching system and the LSR Roller Nut with locking machine heads. What really sets this guitar apart is the neck. The American Deluxe features a comfortable playing ‘C’ Shape Maple Neck with Satin Polyurethane Finish, and stylish Dot Abolone Inlays, which the Abolone’s beauty is really brought to life from the dark Rosewood fretboard. The Fender Deluxe HSS is also amazingly stylish, as it comes with chrome hardware (tuning pegs, whammy bar and the pick-ups) with the finish available in Black, Sunburst or Orange. There are also several pickguards to choose from, making it easy for you to pick the right Deluxe HSS Fat Strat design to choose from. Also like other Strats, the HSS features a string-through-body bridge and a complete premium tremolo system. The HSS also comes ready to be fitted with Schaller strap-locks, so you won’t need to worry about installing a strap-lok system to protect your guitar from accidentally dropping. The Fender Deluxe HSS currently retails for roughly $1250. While this is quite expensive, given the great sound this guitar can produce and all of the features that come with it, it’s a good choice for many guitarists. Gear-Vault Classifieds is an eBay alternative. Come sell your music equipment with us, for FREE! will the LSR nut fit on other guitars like a jackson dinky? Send the Guitar.I need a new Strat.for work.